As the District begins to prepare for the upcoming irrigation season, we wanted to provide irrigators with some reminders to ensure the success of this irrigation season. District staff will operate the irrigation system diligently to provide irrigation water orders. Equally, irrigators need to provide their water order 48-hours in advance of irrigating per the Mandatory Water Order Program. Water Orders can be placed by visiting the District’s website at www.sewd.net and completing the 2019 Water Order Form. Additionally, water orders can be placed by calling the District’s Ag Water Order Hotline at (209) 469-3335 and leaving a message with the requested irrigation information. Mandatory notification is required for any persons diverting surface water provided by the District per Revised Rule No. 120 adopted by the Board of Directors on April 2, 2019. Further, Revised Rule No. 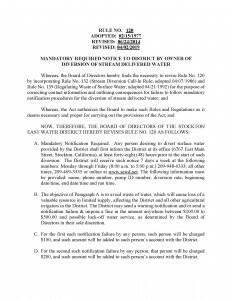 120 outlines District action of irrigator notification failure. As always, collaboration between SEWD and its irrigators during irrigation season is extremely important to us and we look forward to working together this year!